Nursery Management Software System from Nursery In a Box. 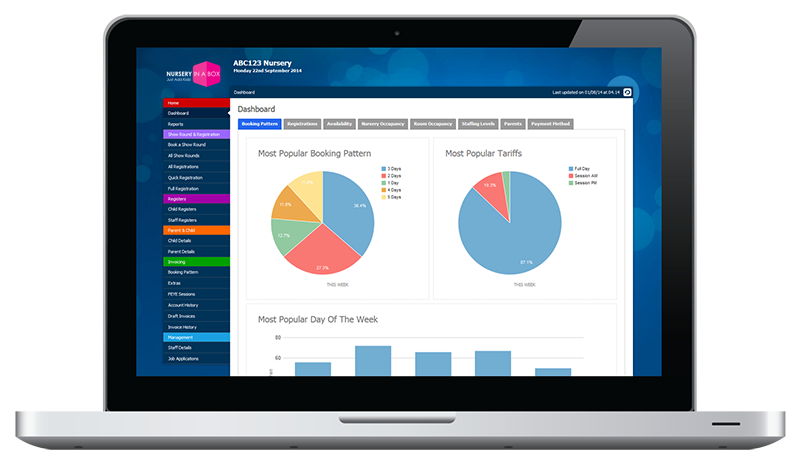 The easiest to use cloud based nursery management software system in the UK. • Make your nursery life easier to manage. • Grow your revenue with one click invoicing. • Integrate your sales ledger with online accounting systems. • Streamline your registration process. • Provide you with high-quality nursery management information. 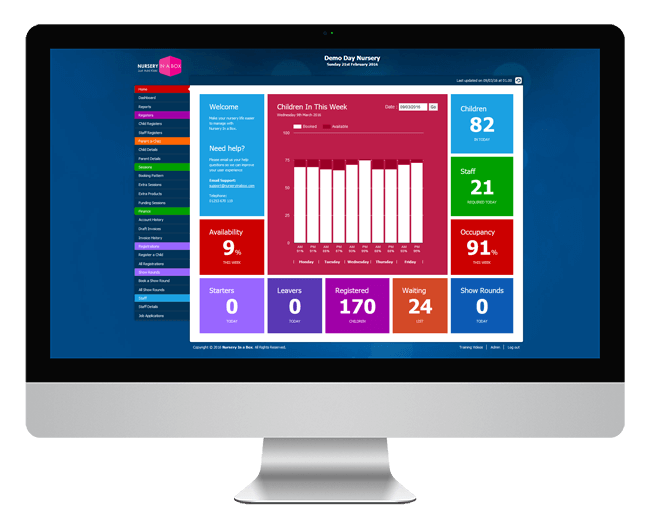 • Put you in control of your nursery admin. The cloud gives you control of your nursery management information and with Nursery in a Box this is now available anytime, anyplace, anywhere from any device whenever you need it. Have been using the nursery management software since the beginning of October. The support from Dave and Milesh has been great, they are quick to answer queries and sort out any problems. The system itself is so simple to use. Its mobile friendly so I can quickly check on my phone/tablet, and the staff can access it on the nursery tablets. The Invoicing system is a one click solution, and the fact that parents have their own accounts means no more queries about payments! The reports are also fantastic. The fact that most of them can be exported to excel and filtered means that you can customise them to find out the relevant information. This is the best nursery management software package you could ever want, it takes the hassle out of paperwork and really helps your nursery maximise the potential! I have been using it for only two months after searching the web high and low for software that really is easy to use and worth every penny. Cloud based nursery management systems have transformed the way traditional paper based nurseries operate causing many nursery owners to reshape everything they do and It’s now a case of when to migrate to the cloud not If. 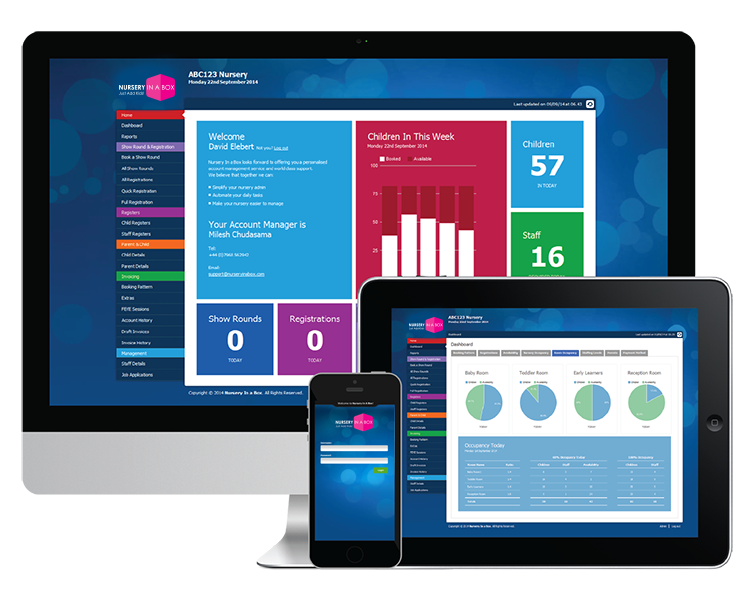 From, one click invoicing to online registrations the cloud allows nurseries, parents and staff easy access to information to make nursery life easier to manage. For most nurseries that’s a lot of information available anytime you need it 24/7. Manage your nursery from anywhere in the world with our highly accredited nursery management software. View the details of your nursery on your computer, tablet, or mobile phone so you never have to go without important updates. We provide unlimited support and unlimited training as we fully understand and recognise that one size does not fit all. Working with you to personalise a management experience that best suits the specific needs of you and your nursery in a partnership approach. We have long recognised that one size does not fit all, so we use a highly personalised partnership approach tailored to you and to your nursery’s specific needs. To summarise, Nursery In a Box saves you TIME. You have enough to worry about in your nursery throughout the day, why not consolidate the sources of your added stress? With all your crucial information in one place, you can spend time doing the things you love in your business. Still unsure? Book a free trial of our nursery management software and see what thinking outside the box can do for you and your nursery business! Book your free trial of our software today! Click the Trial It Free button above or please give us a quick call now on 01253 49 50 51.